In a season five episode of Star Trek: The Next Generation, the Enterprise crew falls under the spell of a dangerously addictive augmented reality game. That same game lies buried within mobile game Star Trek: Timelines, an Easter egg so well-hidden only one player has uncovered it, and they don't even know it yet. Next Generation's 106th episode, "The Game", is notable for several reasons. It features a visit from Wil Wheaton's Wesley Crusher, who at that point had left to attend Star Fleet Academy. Wesley's love interest in the episode, Ensign Robin Lefler, is the acting debut of Ashley Judd. And it's the episode where Riker brings back something from pleasure planet Risa and proceeds to infect the entire crew, only this time it's a video game. 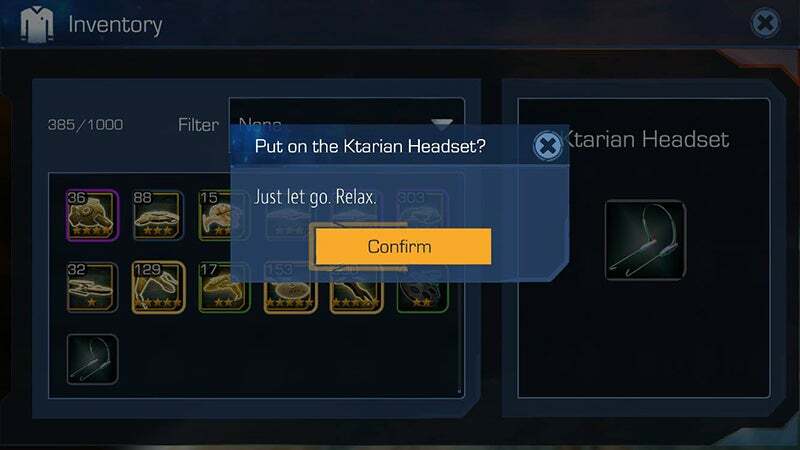 Developed by the Ktarians (Atarians?) as a means to subvert the wills of their victims, the titular game is an interesting concept that was hampered somewhat by the limits of early 1990s technology. 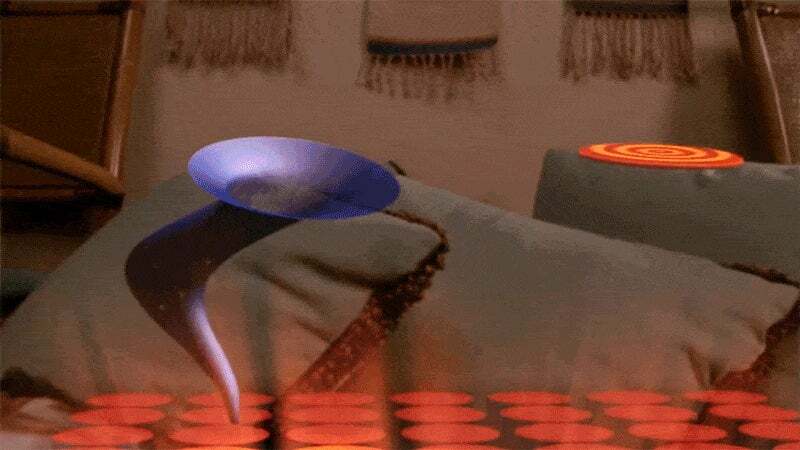 As Riker actor Jonathan Frakes put it, "all it was... was a tuba on a checkerboard." 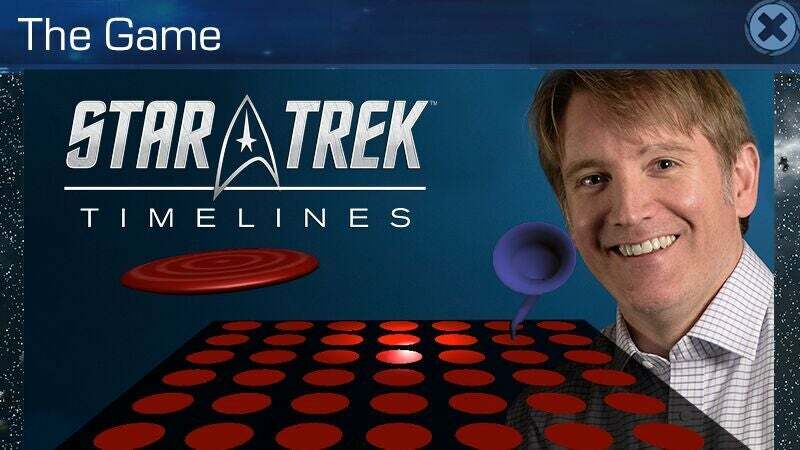 Well that tuba on a checkerboard lives on as an interactive "game" within Disruptor Beam's Star Trek: Timelines. The show-spanning mobile game (which has come a long way since my original impressions) is crafted by developers with a deep love for the franchise, as well as a penchant for Easter eggs. Some are more obvious than others. Combining Voyager's Vulcan security officer Tuvok with bar rodent Neelix to produce their combined form, Tuvix, is an example of an obvious one. The Game is a bit more hidden, to the point where only one player has unlocked it, and they don't even know it yet. This comes from executive producer Rich Gallup, who revealed The Game's existence to me in a recent interview. According to Gallup, The Game's existence in Star Trek: Timelines owes itself to Disruptor Beam's regular in-house hackathon events, where developers are encouraged to create whatever crazy nonsense they feel like making. Gallup, Paul Siegel and Marc Apablaza decided to recreate the galaxy's most addictive checkerboard tuba, and they did. It might not directly stimulate pleasure centres or force players to deactivate any androids that might be hanging about, but there are discs going into cones and arbitrary levels to reach, and that's what The Game is all about. That player doesn't know they have unlocked it, as the inventory item that appears once the specific sequence of events necessary to complete the Easter egg are completed has not been accessed yet. The iOS version uses the device's camera to simulate the augmented reality look of the television show version. The Android version does not, as the option to ask users to use the camera is only available upon initial installation, and without being able to tell players why they needed the camera activated, it was a bit weird. As for the specific steps required to unlock The Game in Star Trek: Timelines, Rich Gallup isn't telling. He did say that while he knows the steps required he himself had not unlocked the game yet, so there is some random chance involved. I guess folks will just have to play the game until they unlock The Game. Wasn't this the plot of a Red Dwarf episode? BTL? One of the best season 5 episodes! I was enjoying this game up until the point where I couldn't do even ONE action without spending money or having pure dumb luck. I keep telling myself I will never download another free iphone game and yet I keep doing it.